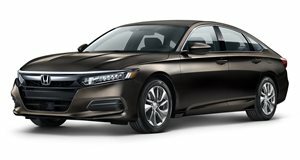 The Accord EX-L completes the EX with a range of premium additions, most notable of which is the leather upholstery. Memory function is added to the driver’s seat while the front passenger now gets power adjustment. A 450-watt premium audio system with ten speakers including a subwoofer is standard, too, while navigation is an available extra. If the EX-L is on your radar, it’s worth the extra $2,000 for the 2.0T engine and ten-speed automatic gearbox.